Welcome back. This is the fifth installment of: “Keep a 5 year Journal.” Click here to see all 12 months. I’m back with a quick observation and another list of questions. I’ve been plugging away at my journal and have a few things to share. As we approach the half way mark of the first year, I think you should give yourself a pat on the back. Matter of fact, if you have someone else in your home – I say you give yourself a vacation! Ask them to do the cards for a few days. The answers will be fun and you can simply have them sign their name so you know which ones they helped with five years from now. Share how you’re doing, ask for encouragement and above all else – BRAG! You’re doing something big and you’re doing great! I’m all caught up and have my cards prepped through May 31st. I hope it’s still fun and you’re enjoying the little bit of reflection each day. I would love to feature your 5 Year Journal here. Please share links in the comments, and/or contact me to be featured in next month’s column. I’d love to share all kinds of journals, so if you’re keeping a digital version, send me a screen shot. For anyone who is new to this idea, I hope you’ll join me on this journey. You can jump in at any time: start on your birthday, on the day of a special event, or just make today special. I love this idea! I think I’ll begin with the June prompts…. I know I may sound like an “add-on queen” but this would be very cool as an APP for a smart-device. 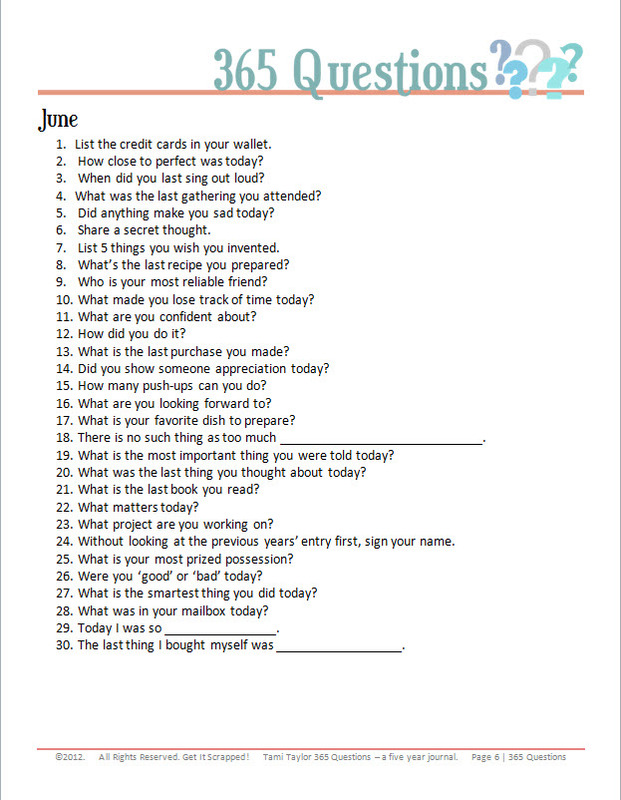 The prompts could pop up each day as a reminder to take a moment to journal…. Anyway, love the idea–very cool indeed! I always have this page and my blog open on my browser. Every night, it’s a ritual to answer the question very last thing before I call it a night! hi! I found this on pinterest. so sad, i’m 6 months late! Anyway, I can’t seem to find prompts for july. I hope maybe I could start, I still have half the year of 2012 left. thank you very much! This idea was great. I can’t either. :-( Need both July and August prompts. Wow just found this site today and Yes I too will be late starting this project but I love the sound of writing a prompt for just one sentence daily. I did something similar on Swap-bot.com but it was a monthly sentence a day journal. this is even better than that for me and doable as well. Just need to decide whether to go digital or do it in notebooks but I am gonna do it for real. Just found this sight and I LOVE this idea!!! Are there any prompt posted for the months of July to Nov? I can not seem to find them? I just found this project and wanted to get it all set up for next year, but I can’t seem to find the prompts for July and on. Can you help? Yeah, I think I may be a little late but I just started my 5 year journal last month and I was wondering if there are any groups or online communities where people post and share their journals? I love this idea! I’m not sure if you’re aware of it, but your links are broken- when you click on the image for the June prompts, it takes you to the file for January, and so on.